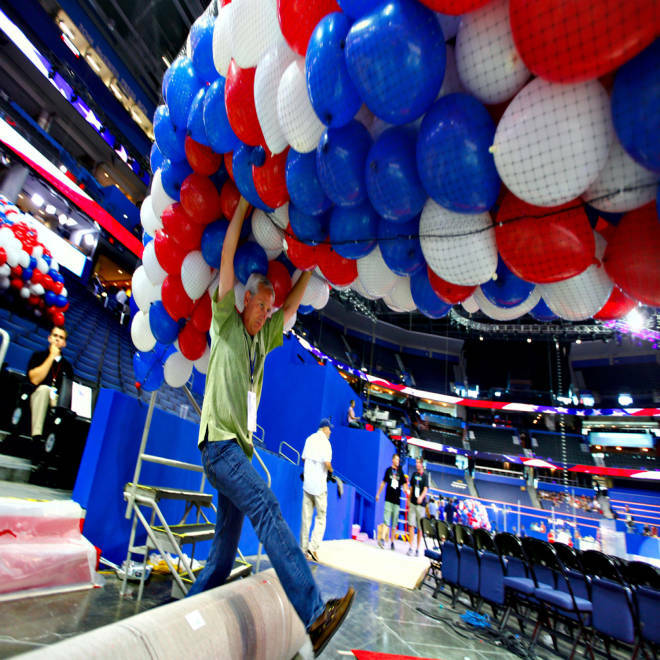 Ron Darling and other riggers load nets full of balloons for the Republican National Convention festivities inside the Tampa Bay Times Forum on Friday. A "salute" to oil baron David Koch. A fete bankrolled by casino magnate Sheldon Adelson. And gala bashes for GOP super PAC donors and bundlers featuring rock stars like Kid Rock and ex-Eagles guitarist Don Felder. Those are only a handful of the big parties planned for Republican delegates, lawmakers and donors in Tampa starting this weekend. While some of the events are well advertised and open to the public, private schedules, prepared for GOP fundraisers and obtained by NBC News, show that this year's convention will once again provide a unique opportunity for lobbyists and big dollar donors to wine and dine lawmakers -- and press their agendas. "It's a mega-fundraising, lobbying extravaganza. Everybody is in one place at one time," says Jack Abramoff, the onetime kingpin lobbyist whose 2006 conviction for corruption led to reforms aimed at cracking down on lobbyist influence peddling. Abramoff, who was released from prison last year and will be attending this year's GOP convention as a commentator for "Inside Edition," said that, as far as he can see, lobbyists and their lawyers have merely figured out creative new ways to skirt the rules -- a point underscored by the dizzying array of parties all week in Tampa. "Nothing has really changed," he said. Storm warnings notwithstanding, the action begins in earnest Sunday at 5:30 p.m. when one of Washington's biggest lobbying firms, Williams and Jensen (whose current clients include the American Bankers Association, Pfizer and Comcast, which owns NBC) hosts a kick-off reception and dinner for GOP delegates at a local eatery called Bern's Steakhouse. Just a half hour later, another big D.C. lobbying powerhouse -- Fierce, Isakowitz and Blalock (current clients: the American Gaming Association, Ford Motor, J.P. Morgan and Time Warner Cable) -- hosts a dinner for the National Republican Congressional Committee and the National Republican Senatorial Campaign Committee at the Tampa Museum of Art. Then later in the evening, oil giant Chevron and Aflac, the insurance firm, are co-hosts of a "Two Step, Soul and Rock 'N Roll" party at the Historic Cuban Club; AT& T throws a competing party at Armani's Grand Hyatt; and the American Action Network, an "issues advocacy group" headed by former GOP Sen. Norm Coleman, teams up with Citizens United for a bash at Liberty Plaza. But delegates may have to pace themselves. On Monday night, the U.S. Chamber of Commerce joins the Distilled Spirits Council for a "Celebrate the Spirit of Tampa" party at the Tampa Aquarium. On Tuesday, Barbour Griffith and Rogers, another of Washington's biggest lobbying firms (among its current clients: Eli Lilly, GlaxoSmithKline and the country of Qatar) hosts the delegates at Stump's Supper Club with a party honoring its founding partner, Haley Barbour, who, after serving as governor of Mississippi and toying with the idea of running for president, has rejoined the firm. But perhaps the most conspicuous honoree is not any member or delegate: It's David Koch, the billionaire oil man who helps run energy giant Koch Industries. Along with his brother, Charles, Koch has emerged as one of the biggest and most controversial financiers of conservative advocacy groups that gave rise to the Tea Party and other GOP causes. On Thursday, Americans for Prosperity -- one of the Koch-backed groups that has announced it plans to spend $151 million on this year's campaign, including a new blitz of TV ads attacking President Barack Obama -- will sponsor "A Salute to Entrepreneurs Building America." There will be two men honored at the event: Art Pope, the group's chairman, and Koch.